The AKC Canine Good Citizen Program offers several great ways to mark your training achievements as you and your dog grow together – The S.T.A.R. Puppy, CANINE GOOD CITIZEN (CGC) and COMMUNITY CANINE (CGCA). Successful completion of any or all of levels is an accomplishment to aspire to and be proud of and can even earn your dog an AKC Title! 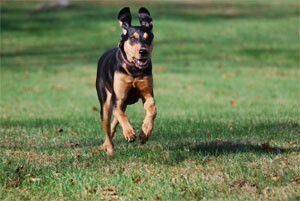 Programs are open to both mix-breed and purebred. Interested in your dog becoming a therapy dog? 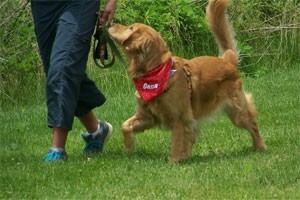 The Canine Good Citizen test closely mirrors the testing provided through therapy dog agencies. Our CGC and CGCA preparation courses prepare you for all components of the tests. Testing is optional so these classes are also great refresher/advanced training courses. Open to dogs up to 1 year of age upon completion of a 6-week Basic I – Family Manners class & STAR Puppy Evaluation. 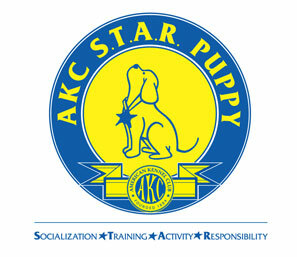 STAR Puppies earn an AKC Certificate and gold medal. Earn a Canine Good Citizen Certificate and/or Title. Our CGC Preparation Course is open to dogs of all ages with ability to demonstrate a reliable level of basic obedience skills. Open to dogs over 1 year of age who have successfully completed the CGC test & have an AKC, PAL or AKC Canine Partners number. This course is dedicated to the most allusive of all…walking politely on leash. This workshop is designed to help you develop more proficient leash-handling skills so you and your dog can be on your way to more enjoyable walks. No More Pulling = More Frequent & Longer Walks = More Exercise = Better Behaved Dog! This class is held INDOOR/OUTDOOR, as weather permits. Coming when called is the single most important behavior you can teach your dog….. having a reliable recall can SAVE YOUR DOG’S LIFE! During this workshop we focus on establishing a reliable recall to two different cues (verbal and whistle). We work in a variety of scenarios that present challenging distractions, including calling our dogs away from other dogs in play. If your dog’s recall response is not what it should be, this is the course for you! This course is also recommended for Hunting Dog Enthusiasts. See Buddy’s testimonial. This class is held INDOOR/OUTDOOR, as weather permits during the SPRING, SUMMER and FALL months. Rally-O is best described as a LIFE-SIZED, EVER CHANGING BOARD GAME in which you and your dog perform a variety of stationary and moving exercises while navigating a course and negotiating obstacles. A foundation in Rally-O has real world applications which allow your dog to participate in more aspects of your daily life. If your goal is to improve your dog’s focus and leash walking skills, this is the class for you! You and your dog will learn to communicate more efficiently and have FUN doing it! Who knows, you may even decide to title your dog in the future. INTRO to RALLY-O exercises incorporate a combination of on-leash obedience skills such as sit, down, stand, stay, wait, come and polite walking. Classes are held indoor/outdoor. In Rally-O UNLEASHED! classes, teams work with their dogs off-leash as they build on what they learned in prior levels. Obstacles are introduced and exercises become more challenging. Prerequisite: Ability to demonstrate a reliable level of basic obedience skill. Learning to navigate an obstacle course safely and correctly is a great way to build your dog’s CONFIDENCE and FOCUS and to bond with your dog while you work as a team. Our LEVEL I course introduces you and your dog to a variety of obstacles – tunnel, teeter, jumps, weave poles, ladder, pause table and tire – in a manner that supports your dog’s individual needs as he becomes comfortable. 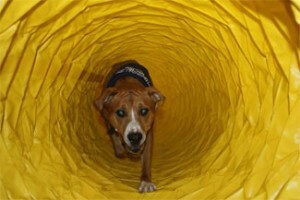 Modified obstacles provide for a low impact experience – perfect for puppies and older dogs. Performing the obstacles perfectly is NOT the goal of this class – watching your dog’s confidence blossom as he discovers his own ability IS.Whatever your training goals may be, this class will provide you with an excellent foundation to build upon while you discover your dog’s potential. LEVEL II builds on what we learned in MTO I and introduces handling techniques and communication skills to navigate your dog thru single obstacles and sequences. LEVEL III uses the techniques you’ve learned to navigate sequences of obstacles (indoor/outdoor as weather may permit). PREREQ: Ability to demonstrate a reliable level of basic obedience skill. Structured 1-hour sessions are held in a variety of public places, offering valuable socialization and opportunities to apply good manners in the real world. Groups are small to provide for focused training experiences individualized to the needs of the students. 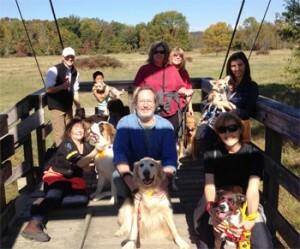 Venues include shopping malls, town centers, trails, parks and other dog-friendly establishments. Prerequisite: Basic 3 or permission of instructor. Dog and people-friendly dogs only. Tricks are a fun way for dogs to expend physical and mental energy in a positive and productive manner while owners improve communication skills with their canine companions. Our Trick & Treat classes mirror the requirements of the AKC Trick Dog Program. 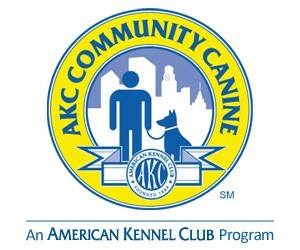 The option to earn an AKC title is available (separate fee applies) upon completion of the course. Level 1 (Novice Trick Dog): Class participants will gain a foundation for teaching basic tricks and will learn at least 10 skills from this list of 20. Choose your top 4 choices and we’ll do our best to incorporate them into the course. Prerequisite: Ability to demonstrate a reliable level of basic obedience skills in a group environment.